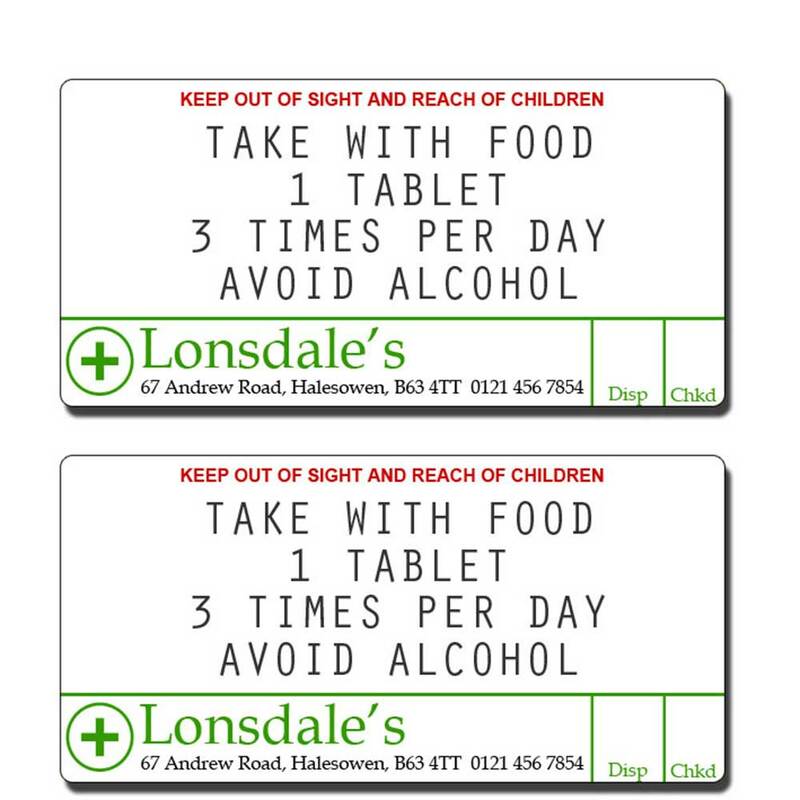 Positive ID Labelling have been manufacturing Medicine Labels for over 20 years. PID is a family run business with dedicated, highly skilled staff able to make your labels to specification. Material, design, adhesives and quantities will have an impact on the cost of your Medicine Labels. If you would like to discuss your needs for a quick response, call us on 01332 864895 and take advantage of our knowledge. We can make labels to virtually any shape or size. We already have hundreds of cutters and our digital equipment is completely versatile. We can print your labels on a range of plasticised or paper-based materials in a range of base colours and finishes. Unit prices for you Medicine Labels will fall with the volume fo labels you order. To get a quick idea of price, call us on 01332 864895 or fill in the form below. We have manufactured billions if not trillions of labels and do so to the highest standards. We can do the same with your Medicine Labels. Our printing equipment includes the latest flexographic and digital presses – we have invested over £600,000 in new equipment in 2015-2017. Shorter runs lend themselves to digital printing but longer runs (over 20,000 labels for example) are cheaper when made flexographically. Our Jetrion 4900 digital press uses ultraviolet inkjet technology to print full colour Medicine Labels without the need for printing plates or cutters. If we make labels using our digital press, the costs and time delays associated with printing plates and cutters are avoided and savings passed to you. Our digital printing press includes a laser die cutting station – your labels will be cut out using high power lasers no on a rotary metal cutter. This means your labels are cut to shape with a laser, not a metal die on a cylinder. Cutting labels this way means no tooling costs and you can have any shape we can draw in the computer! Flexographic printing is ideal for high volume label orders. It reduces unit prices and is a faster printing technology compared to digital. Our 6 colour Rotopress is suitable for a wide range of water-based ink work where the artwork is simpler in its nature. For photo-like reproduction, our brand new MPS 350 is the press for the job, with 100m+ per minute print speeds. Coming into operation in April 2018, the MPS allows us to perform a whole new range of production methods, hitherto unavailable to us. Call us now to discuss your order on 01332 864895. If you would prefer us to call you, fill in the form below and someone will call within an hour or so (working hours only).